The Multiple Choice content type is your staple multiple choice quizzing tool. Multiple Choice can be used to test the learner's level of knowledge on a given topic. Multiple Choice questions can be used for testing well-defined skills related to a certain topic. Mulitple Choice questions can be an effective assesment tool when thay are created properly and the learner is given immediate feedback on own performance. The H5P Multiple Choice questions can have a single or multiple correct options per question. Multiple Choice questions can be used stand-alone or they can be used in Question sets, Interactive videos or Presentations. Either way, they are created in the same way. Navigate to the menu that enables you to create new content. In Drupal, you select Interactive content. In WordPress you press Add new under H5P Content in the admin menu. In WordPress you select H5P Content and Add new from the admin menu. Select the Create option for H5P. If you find Multiple Choice question in the list of Content types, skip to Step 1. 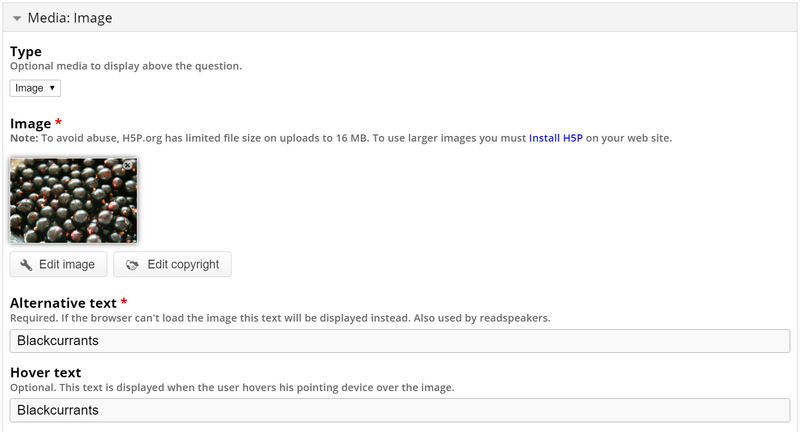 You will now find Multiple Choice question in the Content type list when creating a new H5P. A shrub, Ribes nigrum, that produces small, very dark purple, edible berries. Head over to where you usually create new content on your platform. In Drupal you go to Create content and select Interactive content. In WordPress you press Add new under H5P Content in the admin menu. In WordPress you select H5P Content and Add new from the admin menu. Then select the Create option for H5P and choose Multiple Choice question from the list of Content types. In this tutorial we'll focus on creating the Multiple Choice question content using the above example. The Multiple Choice question content type consists of a question and a set of options. The Question is used to introduce the problem to be solved, and the Options are the possible answers the learner can choose from. Under Media, you can add image or video files relevant to the question. This picture by Karen Jackson was found on Flickr and is licensed with the Creative Commons Attribution-NoDerivatives license. Use pictures that are similar in size to ensure a smooth user experience for the learner. 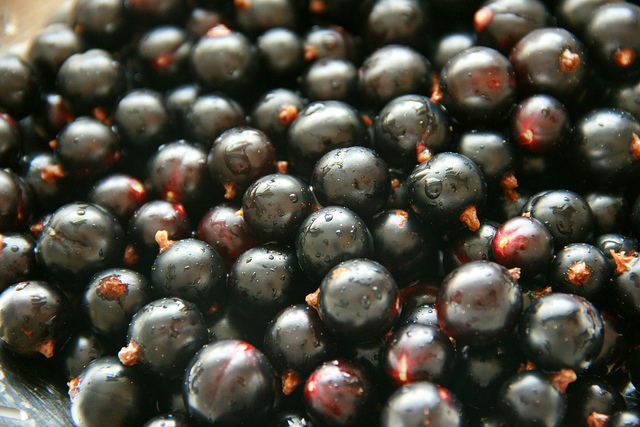 What color does the blackcurrant berry actually have? Under Available options, we add the answering options the learner can choose from. Two empty available options are listed by default, since we usually need at least one correct and one incorrect answering option. Type in Very dark purple in the field labeled Text under the top Option and check the Correct checbox as this is the correct answering option. Move on to the second and bottom Option, and type in Blue in the text field labeled Text. Leave the Correct checkbox unchecked as this an incorrect answering option. Another Option will be added after you press Add option. In the third and now bottom Option, type in Black in the text field labeled Text. Leave the Correct checkbox unchecked as this a second incorrect answering option. We are now done with adding answering options. button in the top left corner of the Option. By default, question type 'Automatic' is selected. If you have multiple correct options, then it will behave like Multiple choice and checkboxes will be displayed automatically. If you have one correct option, then it will behave like Single Choice and radio buttons will be displayed automatically. You can select the question type 'Single Choice' from the drop down, if you have single correct option and radio buttons will be displayed. In this case we only want to use a single correct answer, so we'll keep the default question type as 'Automatic' from the drop down present under Behavior Settings.The Give one point for the whole task is more relevant when Multiple Choice questions are used in Question sets, Interactive videos or Presentations, so we're not concerned whether this is checked or not for now. Check the Randomize answers checkbox to make the answering options display in an arbitrary order. This is an optional step and you can skip to Step 9 to finish up. Multiple Choice allows the learner to get feedback on selected answering options. This might be useful to provide the learner with pointers on what to study more after selecting a certain answering option. 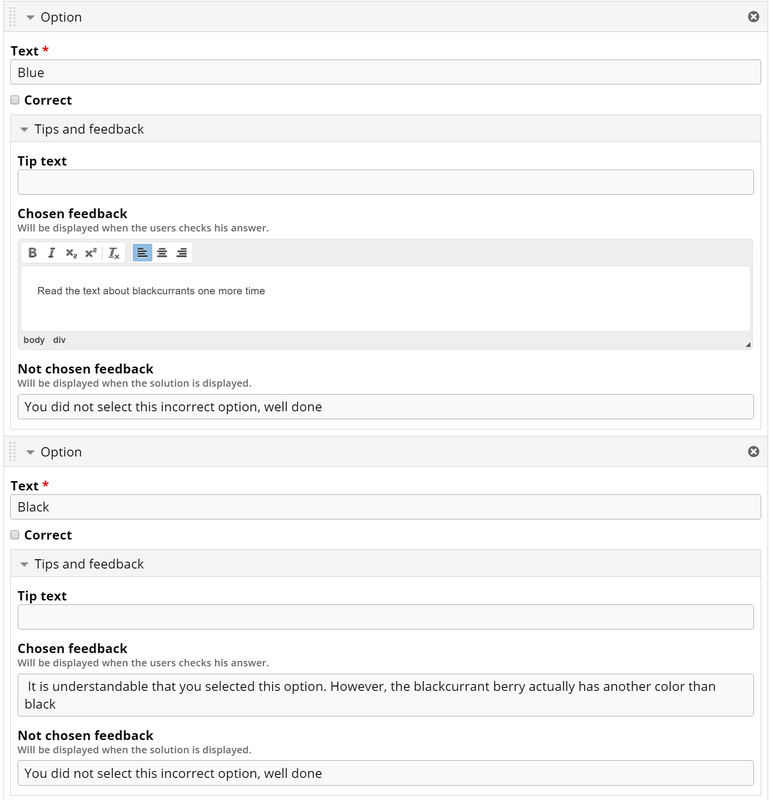 For each option we'll add som feedback to the learner. 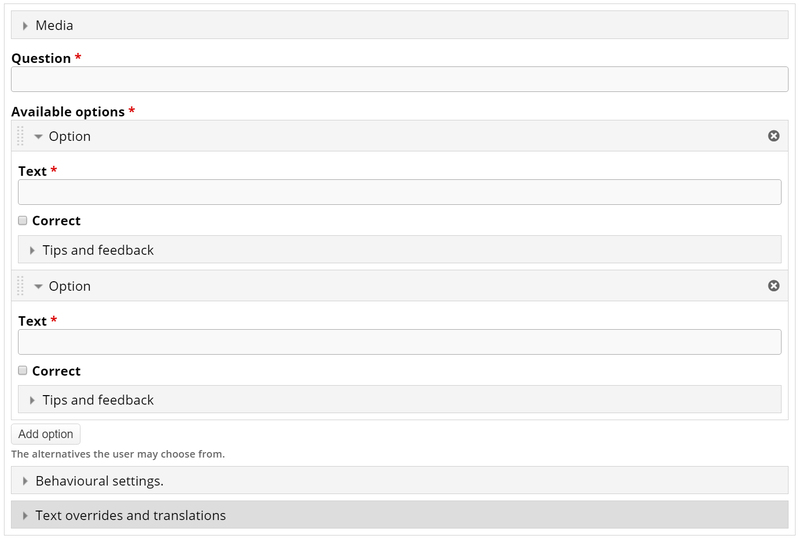 In the first and correct Option we type in the text You selected the correct option, well done in the Chosen feedback field. In the Not chosen feedback field, type in the text Read the text about blackcurrants one more time. button to collapse an Option for a better overview when editing. At the bottom of the editor, you'll find the Enable try again button option. Leave this checked, as we want the learner to be able to try to solve the Multiple Choice questions multiple times. Save the node/article to view your finished Multiple Choice question. Hello I can't set more than one multichoice question at a time. if want to set up to 10 multichoice question, how do i go about it? To do that you can use the Questionset content type, and add multiple multichoice questions to the questionset. See the questionset tutorial. We're also experimenting with a miniquestionset content type where you can add many singlechoice questions and get a more lively user experience. I just stumbled across H5P project, and I am amazed. It's a fantastic idea, and as a Drupal and Worpress webmaster, I see some major opportunities. Is there a way to tag questions throughout the video at various points? For instance having a video stop at 1:10 to answer a question before moving on with the video. Have you tried to create interactive videos? I think having individual feedback for each answer option is good but I'd also like to see the addition of summary feedback for the whole question that you had the option of revealing if the question is answered correctly or incorrectly. Are there any plans to incorporate such a feature? If you post a number of answers in your MC question, but mindful that when the user clicks on the "Show Solution" button, the length of the content will cause a scroll bar to appear within the content space allocated within the video player space. Some users might not be expecting scrolling content within a video player (when have they ever seen that before? ), so they may miss the content hidden below the bottom. This issue is the same even if you are in full-screen display (the internal content scales along with the video player). It would be handy if there was a more prominent indicator that there was more content below the screen other than just the subtle appearance of a grey scrollbar on the right. I created a Jira task on this, so it can be looked into. Hi there, I've noticed the Jira task is unresolved. Can I help provide more information to get this fixed please? If you sign up to the Jira board which tomaj linked to you can help provide more information to the issue to help getting it resolved. Hi, I find it surprising that the choice for sound is not available in the media menu for muctiple choice questions. Are you planning to add it or is there a round about way for me to add mp3's in my MCQ's. There are no plans for exactly what you are asking for. But there are some (unfinished) plans for audio improvements, that might spill into the realm of what you mention. A hack for what you want, might be to have the audio in a video. But that's the best I can think of for now. How to add second question. I cannot find add new question option. Hi! Is there a feature here that is similar to the Math editor in MS Word? Not yet. There have been quite a few requests for it. Hi. In Interactive Video, what do you click or create so that the user must answer the correct answer before moving onto the video? It seems like now, they can just click any answer and hit submit and they will move on. When I create a multiple choice, the problem is an image, when it displays, the image looks small with a + button, is it possible to make it look big with a - button? Customise look and feel some more? Thank you for the pointer. Sorry, it hadn't occured to me to look under 'developer guide' .... that reflects my curent level of knowledge :) But hey it's going to be a wet weekend, it's time to get my learning hat on. You're welcome OTTLtd, if you have any questions/clarifications feel free to post in the forums. Hello everyone. I love this type of content. A consultation, I have created multiple choice questions and I have placed scores. The overall score is 100, but if I'm wrong in one question, it puts me in 80, when in reality it should be 95. I'm setting it up wrong? How do you do with the scores? Do you mind sharing the content that you created so that we can check? Saving the content erases paragraphs. Is it possible to use html tags (or at least something equivalent to the <p> or <br> tags) with Multiple Choice Questions? Using HTML tags are not possible as of the moment. But if you could share a screenshot and the content that you are creating maybe we can't find a solution to your issue. Also to do this please post a separate thread for this. Hi, is there any way to add a hyperlink (e.g. to a url) in the question? Is there a way to center the image over the question? 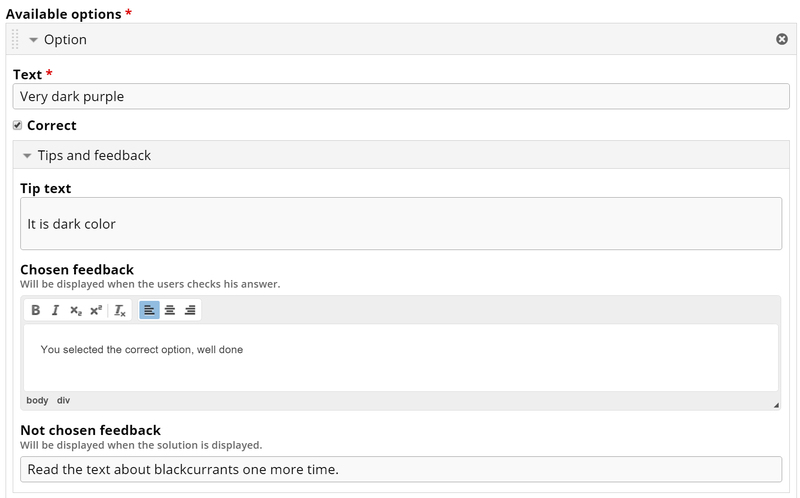 Or a way to set the image to zoom and take up the whole top of the question (like in the blackberries example question)? Centering is not possible but occupying the half top of the screen is. All you need to do is use a big enough pixel wise and disable image zooming in the behavioural settings. If I'm not mistaken the example above uses an image that is 1024 x 683.